Cycling has always been a big part of Sustainable Cherry Hill’s Earth Festival. Prior to the festival each year is a Family Fun Bike Ride. The bike ride starts at 9 a.m. at Croft Farm, winds through the surrounding neighborhoods and ends back at Croft Farm in time for the start of the festival. This year, cyclists will have a special place to put their bikes once they arrive at the festival. The seventh annual Sustainable Cherry Hill Earth Festival, taking place on Saturday, April 30 from 10 a.m. to 2 p.m. at Croft Farm, will include valet bike parking for the first time. The bike parking will be located near the flagpole on Bortons Mill Road across from the Croft Farm house. Metal bike racks will be used to keep all of the bikes in place. Brenda Jorett, producer of the festival, said the area is being created to encourage more people to think about biking to the festival rather than driving. “We’re aiming to encourage people to be healthy and also reduce the carbon footprint of the festival,” she said. Cyclists who ride their bike to the festival can bring their bike to the valet lot for free. They will receive a ticket to be used to retrieve their bike once they’re ready to leave the festival. Sustainable Cherry Hill’s Way to Go task force is spearheading this program. Jorett said the hope is to get the word out this year and increase the number of people riding their bikes to the event in the future. This year’s festival will be just as big as in previous years. More than 100 sponsors, vendors, groups and displays will be scattered around the Croft Farm property. One small change will be where all of the tents are located. 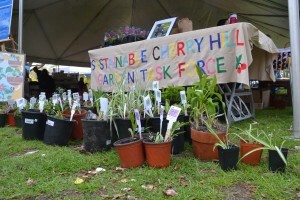 Last year, the festival had some vendors located across from Croft Farm. This year, all of the tents will be kept in one general area. “We’re keeping everything to the three acres on the grass and surrounding area,” Jorett said. All of the space for vendors, sponsors and nonprofit groups were filled nearly a month prior to the festival. A number of new demonstrations on sustainability will take place this year. The Rutgers Cooperative Extension of Camden County will be doing a rain barrel demonstration during the day. In another demonstration, students from Cherry Hill High School East will teach how to compost at home. The involvement of Cherry Hill Public Schools will be a big part of this year’s festival again. All 19 schools will have a display, activity or demonstration set up at the festival. The biggest goal for Sustainable Cherry Hill each year is to have visitors learn something new when they visit the festival. “If everyone goes home with one new different idea to impact sustainability or climate change, we know we’ll be successful,” Jorett said. Sustainable Cherry Hill’s Earth Festival is free and open to the public. It will be held on April 30, rain or shine. For a full list of sponsors, vendors, entertainment and more, visitwww.sustainablecherryhill.org/earth-day-festival.